Fat has long been regarded by ancient cultures as a sign of prosperity, privilege, fertility and beauty. The age-old fattening process of brides is seen as both financial and cultural investment. While in isolation, the bride-to-be is fed with sumptuous dishes and is forced to eat regardless of appetite. This observance was commonly seen amongst the Efiks, Ogonis, Ikweres and Ibibios of Southern Nigeria. Over the years, it has never been an issue of much concern until recently when it was declared to be a risk factor of many known killer diseases. The World Health Organization alleges that the number of obese persons have more than doubled over the past 35 years with over 2.8m people dying each year from obesity-related diseases. The WHO defines obesity as having BMI ≥ 30. 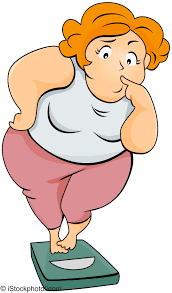 Most times, signs of obesity start off with a state of being overweight with BMI ≥ 25. The body mass index in children is calculated differently. BMI does not always reveal a person’s body fat status because it is possible to have a normal weight despite a high body fat percentage. This condition is known as normal weight obesity. Physical inactivity due to increasing sedentary lifestyles. Increased intake of energy-dense food with high fat. Medications: Some medications such as antidepressants, anti-seizure medications, diabetes medications, antipsychotic medications, steroids and beta blockers can lead to weight gain if not compensated through diet or activity. Social and economic issues: The people one spends time with may influence such person’s weight — you're more likely to become obese if you have obese friends or relatives. People may not have money to get healthy foods and may then go for junks while others have too much to spend on junks rather than healthy foods. Certain medical problems such as arthritis can result in decreased physical activity. Eating healthy foods with less fat, sugar and alcohol.